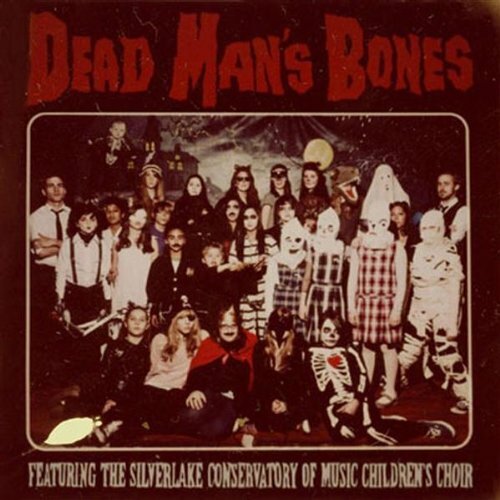 What would be your first thought if I told you about a band named Dead Man’s Bones, started by a well known actor, that incorporated a children’s choir that sings Halloween songs. Many of you might consider me crazy. Next I’m going to tell you it’s really good. Dead Man’s Bones is a band started by Ryan Gossling and Zach Shields. They perform in collaboration with the Silverlake Conservatory Children’s Choir that was started by Flea of the Red Hot Chili Peppers. Dead Man’s Bones is very much a Halloween album, but not done in a corny or silly way. Gossling and crew take what they are doing seriously and crank out some great Halloween related tunes. The album, “Dead Man’s Bones” (released in 2009), starts off with “Dead Hearts“, a slow haunting track that is mostly just creepy, whisper vocals, some basic drums and a heart beat and other creepy sounds buried below the music. “In The Room Where You Sleep” gets things going with almost a surfer vibe. It utilizes the same whisper vocals but lays them over some melodic keyboards. They throw in some nice drumming and some hooks to keep interest. It keeps up the moderate, surfer-esque tempo throughout. “My Body’s a Zombie For You” changes things around once again. This time creating a more 50’s slow rock sound. Gossling sings deep and low, while background vocals adding in some even lower rhythm. Piano and tambourine can be heard interlaced with slow, creepy drums added in. The kids choir is right up front on this song with chorus. Similar in vein, and my favorite song on the album, is “Werewolf Heart“. It’s simple and basic with Gossling’s slow and haunting vocals, some piano and tambourine put in next to some nice bass lines and drums for rhythm. It also has a nice bridge with some acoustic guitar and background wolf howl sounds. The song “Dead Man’s Bones” is more upbeat. It’s faster paced with some foot stomping drums, nice bass lines, creepy background vocals and Gossling singing more upfront. The lyrics to the songs on Dead Man’s Bones adds a lot to the mood of the music as well. For most of the songs the lyrics stay smart and creepy. They never go into corny or grotesque so the album stays appropriate for all ages. So if you are looking for that album to play during your next Halloween party, Dead Man’s Bones is an excellent choice. It’s also perfect to listen to any other time of the year.